Paul McCartney and Ringo Starr pay tribute to Tom Petty. Beatles Radio: The Beatles, Solos, Covers, Birthdays, News The Fab 4 and More! 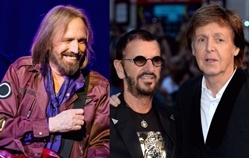 Beatles stars Paul McCartney and Ringo Starr have paid tribute to the late Tom Petty. Rock icon Petty suffered a cardiac arrest at his home in California on Sunday (October 1) and died in hospital yesterday (October 2) at the age of 66. As tributes to pour in from Petty’s musical contemporaries, McCartney and Starr have both sent messages of condolence via Twitter. Starr, meanwhile, wrote: “God bless Tom Petty, peace and love to his family”. He added: “I’m sure going to miss you Tom”. See those tweets below.